In May 2011, Ian Bazalgette Junior High School proudly launched the Baz Strong to support their at-risk students and help them realize their full potential through academic and athletic opportunities. Ian Bazelgette Junior High School is located in the Dover area, where 25% of the population lives below the poverty line. For some students, proper clothing, lunch, and school supplies are a luxury and most students don't participate in any extracurricular activities. SHLF is thrilled to partner with Ian Bazelgette to provide these opportunities and to help build essential life skills to reach their full potential. 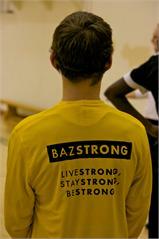 The 2011/2012 Baz Strong Program consists of 21 grade 7-9 students who were previously failing at least one subject. Each Friday, the program offers 1.5 hours of focused study time where students receive guidance and tutoring from teachers. Afterwards, students participate in a variety of athletic activities such as kickboxing, basketball, soccer. On select Fridays, students get to hear special guest speakers and go on field trips. The program has helped students get back on track academically with all 21 students currently passing all of their classes! SHLF is thrilled to see your contributions Making a Difference! A heartfelt thank you for your continued support. Take a Hike’s goal is “to be the North American leader at enabling communities to empower at-risk youth to achieve their full potential, realize their dreams, and give back to their communities". In order to achieve this goal they have teamed up with LIFT Philanthropy Partners to help them to expand to other communities such as Abbotsford, Richmond, Prince George and/or Trail. Furthermore, Governor General David Johnston recently visited Take a Hike and declared that he would like to see the program replicated across Canada. For more on Take a Hike’s partnership with LIFT Philanthropy Partners and on Governor General’s David Johnston’s visit click here. On the ground Take a Hike students have been very active having recently returned from their winter expeditions. These multiday expeditions had them snowshoeing for several hours a day and sleeping in self-built snow caves at night - adding yet another challenge to the overall experience. In the meantime students are busy with school and training for their next multiday expeditions coming up in the Spring. Streetfront has also been keeping active as usual this winter season with many snowboarding and snowshoeing trips to Cypress Bowl and Mount Seymour. In addition they have been heavily involved with environmental stewardship by partnering with The Environmental Youth Alliance and Britannia’s Urban Garden Project. Streetfront students are currently constructing compost bins and planning plants for spring seeding. They are also planning to participate in a pollination and bee hive building workshop soon. Streetfront students are also heavily involved with a large totem pole carving project based out of Britannia. This is an amazing project that includes one 41 foot totem pole and two 10 foot totems which will all become part of a native housing initiative on Pender Street. Streetfront students have helped with the vision for the project and will now begin working on the smaller totems. In addition a number of Streetfront students are working with SACY which is a Vancouver School Board sponsored drug and alcohol program. SACY helps kids deal with management and treatment issues for drugs and alcohol. They have a continuing series of forums and volunteer opportunities for the students. This has been a very positive experience for them. A few Streetfront students have even signed up for their poetry slam competition. On top of all this Streetfront students are keeping up with their marathon training and school work. The Vancouver School Board has recently put out an excellent video highlighting what Streetfront does which can be found here. Also, you can now keep up with what Streetfront is up to on an ongoing basis by following their blog here. The SHLF-sponsored basketball season is in full swing with the NDG Community league starting back on February 11th. This means 80 youth are participating in 5 age group teams (7-9, 10-12, 13-17) all made possible by YOU. In January, Loyola and Westhaven teams both participated in a local sports festival organized by the City of Montreal's Sports and Recreation Department. During the tournament, all players played multpile games over 2 whole days and thoroughly enjoyed it! In addition, thanks to YOU the first referee clinic, an initiative they had been hoping to achieve for some time, took place. In this clinic, 14-18 year old teens participated in a 12 hour class and have now been certified to work as junior referees in the NDG Community Basketball league. The leagues will continue to run throughout the winter and spring and the youth continue to improve daily!